Georgetown's rich Catholic and Jesuit faith tradition promotes inter-religious dialogue and understanding. Our community integrates faith and learning with a commitment to help each member develop his or her unique faith life through worship, reflection, and service. 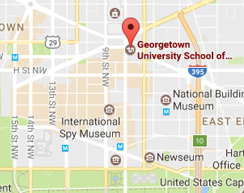 SCS students are also encouraged to connect with the Georgetown Campus Ministry staff affiliated with the Georgetown University Law Center (GULC), which is located one half-mile from SCS. Chaplains are available to meet by appointment, and SCS students are invited to join the GULC community for Prayer & Worship Services and Events. When: Tuesdays at 4:30 p.m. When: Tuesdays at noon; Thursdays at 4:30 p.m. When: Fridays from 12-12:30 p.m.